Can I detach my concurrent license for offline use? Yes, a NetPoint license can be detached to a workstation by following the steps below. Open a web browser on the local machine you wish to detach and type http://localhost:1947. Make sure the license has been activated by following steps 2-7 from the Concurrent Licensing section. Once activated, choose the Detatchable Licenses tab. Check the box next to Enable Detatching of Licenses. Click the Detatch & Attach button. NOTE: The license will be restored after the number of days next to Max. Detatch Duration. How do I activate NetPoint (single user)? From the Windows taskbar, click the Start icon. Choose the NetPoint 5 folder. Choose NetPoint Activation. The HASP window will open. Click the Collect Information button. An Explorer window will open. Navigate to the file in Windows Explorer. Zip the file by right-clicking on the file and choosing Send to > Compressed (zipped) folder. NOTE: Once NetPoint support receives your zip file, they will email an updated activation file back to you. Unzip the file by right-clicking on the file and choosing Extract All. Follow steps 1-4 under Collecting Information above. Click the Apply License Update tab. Browse for the unzipped file and click Open. I am presenting a NetPoint schedule to a group. Are there any documents I can provide that briefly explain how NetPoint works? Yes, this one-page download gives a brief overview of the presentation of the plan, a description of planning elements, and definitions of major terminology. I’m an IT person investigating how NetPoint is installed and what needs to be done to accommodate it. Where can I get resources to help me out with this? See “Related Resources” to below for links to the system requirements, installation, and licensing. For specific questions please contact Ken Macsay, Principal Associate of IT, at kmacsay@pmaconsultants.com. I’m using the “Send as Email Attachment…” function in NetPoint with Outlook, but this message keeps appearing and will not go away. How can this be solved? What system defaults are required at installation? If I buy NetPoint, when and how will I get it? Once a purchase order is placed from the PMA Technologies online store or a purchase order has been issued, an email will be sent to the name on the purchase order or the email provided online within 2 business days. The email will include a link with a username and password. Once clicked, you will then be prompted to download the software after which you may proceed with the installation. Is it possible to get a lunch and learn online tutorial on NetPoint? Yes, tutorials can be arranged by contacting Renee Woolley, Director of Marketing, at rwoolley@pmaconsultants.com. Is NetPoint available on the cloud? How does that work? Yes, the software is also made available by means of NetPoint® in the Cloud, a browser-based application that allows the user to access and use NetPoint Premier without having to worry about any IT matters related to the deployment of new software. All that is required is internet access and a Citrix enabled device (mobile phone, Mac, tablet, etc.) with a Java plugin on the local browser. NetPoint® in the Cloud supports import/export with Primavera P6 v. 6-8, Microsoft Project 2007 and later, and Microsoft Excel 2010 and later. NetPoint® in the Cloud is available for $3,000/year sold by annual concurrent subscription accessed by an account and password. If not renewed, online NetPoint access will discontinue on the subscription expiration date. PMA Consultants provides this option hosted on a PMA server. What are all the license installation options? If you are a university faculty or student, please contact us as info@pmat.sourcedigitalmarketing.com for academic licensing information. What are NetPoint’s system requirements? Supported schedule size depends on the number of total objects (activities, links, milestones, etc. ), the computer’s processor/clock speed, and how much RAM it has. With a well-equipped machine, a delay of about 0.5 seconds can be expected for a schedule between 500-1,000 total objects, which is considered to be a tolerable upper limit. You can continue to work with a schedule until about 2,500 total objects with a delay of 1 second. For NetRisk, a minimum of 8GB of RAM is recommended with no more than 350 total objects. NetPoint requires a minimum screen resolution of 1024×768 and a 16-bit color setting. Higher resolution and a 32-bit color setting result in a better graphic image. What are the differences between GPM® and CPM terminology? GPM and CPM share some similar concepts. However, some of these concepts are referenced by different terms in one framework vs. the other. Continue reading to view a table that highlights the different terms that are used for these common GPM and CPM concepts. What is the HASP utility? The HASP® utility, also known as the HASP Admin Control Center, is a customizable, browser-based application of Sentinel HASP®, a third-party product developed by SafeNet® that is deployed by PMA to enforce software protection and concurrent licensing of NetPoint. It is installed on the local NetPoint server associated with a company network, and allows end-user IT administrators of that company to monitor and manage the concurrent NetPoint licenses that they have purchased. Country: All activities and milestones in NetPoint® are assigned a calendar. Whichever country is selected will become the default calendar for all new activities and milestones. This setting, however, is only a default – from within NetPoint, a new calendar may be defined and set as default, or activities may be assigned different calendars individually, regardless of the default setting. Time Unit: If PolyTime™ is enabled, the user will have the option of setting the default time unit. All new schedules will initially inherit this time unit, but a different time unit may be chosen at any time during planning. Unlike calendars, the time unit may not differ from activity to activity – once set, it applies to all objects within the schedule. Name/Email: Email notifications may be sent to project recipients to alert them of changes in resource consumption. The address entered is used as the return address in case an email is delivered unsuccessfully. If desired, a different name and/or email may be entered from within NetPoint just before the email is sent. How can I change the size of the canvas? Zoom/Stretch: The zoom function magnifies or shrinks the canvas proportionally. The stretch function increases or decreases the horizontal width of the canvas. Zooming and stretching will only temporarily enhance readability on a digital display. They will have no effect on the printed page and they will reset when the file is printed or saved and closed. To permanently affect the canvas, you must adjust the page size or grid spacing, or use page tiling. To zoom and/or stretch, click the Zoom/Stretch icon in the toolbar. Page Size: Choosing a new page size will permanently increase or decrease the horizontal width of the canvas by stretching it, and it will permanently increase or decrease the vertical height of the canvas by adding or removing gridlines. It will not, however, stretch the canvas vertically. To adjust the page size, click File > Print Setup… from the menu bar and choose and new paper size. Grid Spacing: Changing the grid spacing will affect the vertical aspect of the canvas but not actually stretch it (increase or decrease its height). 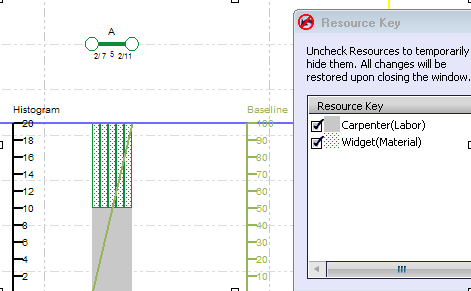 To adjust the grid spacing, click Schedule > Modify Settings… from the menu bar and choose the Formatting tab. The grid spacing can only be increased if the last gridline is unoccupied. If objects already exist on the last gridline, then the grid spacing cannot be increased unless the objects are moved higher. Print Tiling: If the maximum page size is still too small, the canvas may be tiled across multiple pages. Choose File > Page Setup… from the menu bar. Pages may be added horizontally and/or vertically to enhance readability. How can I make the text size more readable? To change the text size for objects, choose Objects > Change Text Size for All Objects from the menu bar. All object data (descriptions, IDs, dates, float, etc.) will change proportionally, and for every object, selected or unselected, on the canvas (excluding text boxes and annotations). To change the text size for the calendar strips, click Schedule > Modify Settings… from the menu bar and choose the Formatting tab. Adjust the value next to Strip Text Size. The Canvas may also be magnified through the zoom function, which will enhance readability even more. Why can’t I change the time unit higher? Once an object has been placed on the canvas, the time unit may only be changed to a smaller time unit (e.g. days to hours, but not hours to days). This restriction is enforced because converting to a smaller unit is always unambiguous and will never result in changes to dates or durations. For example, two weeks is always 14 days or 336 hours, so there will be no changes to activity dates or durations. Converting to a larger time unit would involve either rounding or truncation and would potentially result in changes to dates and durations (which would result in altered gaps, floats, drifts, etc). How can I create a network diagram independent of time and dates? Sometimes, it may be desirable to create a plan without focusing on dates. While it is impossible to truly ignore the time-scale, the effect can be achieved easily. If starting with a blank schedule, turn off the dates (and/or times) for all new activities created. Click Objects > Set Default Properties for New Activities… from the menu bar and uncheck the boxes next to Dates (and/or Times). Next, click Schedule > Modify Settings… from the menu bar and choose the Displays Tab. 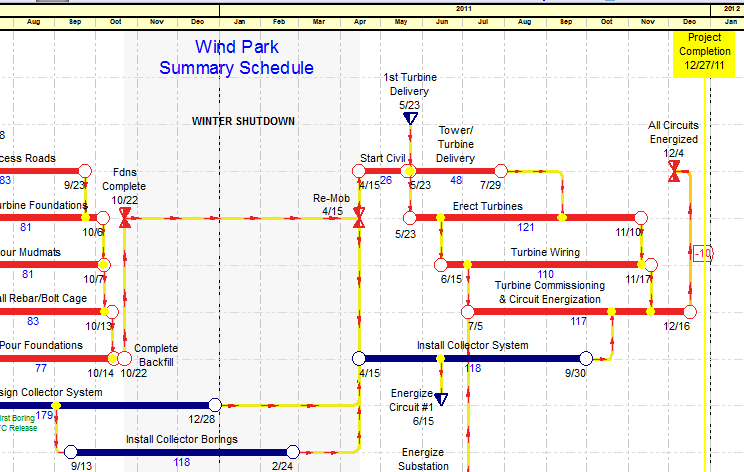 Uncheck the Project Start, Project Completion, Holiday Line, and all Calendar Strips and Sightlines. Now, the only indication of time will be at the cursor (when it hovers over the canvas) and the duration. You may go a step further and turn off the duration for all new activities and change the default calendar to “Calendar Day Calendar” so the cursor date always shows black. How do I clear the yellow box surrounding a blocking object? If an object is blocking the movement of another object (i.e. if it has been actualized or constrained), a notification will appear and it will become spotlighted in yellow. To clear the yellow box, make a change on the canvas (such as modifying the dates of any object) or choose Objects > Restore Color for Faded or Blocking Objects from the menubar. More than two activities can be linked together using the FS Chain Link icon on the toolbar, provided that they are all finish-to-start (no overlapping). Select the desired objects on the canvas by drawing a box around them with the Select Tool or by selecting them individually with the Multi-Select Tool. Click the FS Chain Link icon on the toolbar. The regular Link icon will only allow two activities to be connected at a time. If two activities selected for linking are overlapping on the timescale (e.g. the start of a successor starts before its predecessor finishes), an error message will occur. This is because there’s no way to know whether the start of the predecessor should be linked to the start of the successor or if the finish of the predecessor should be linked to the finish of the successor. To avoid such ambiguity, place a start embedded node on the predecessor (to create a start-to-start relationship) or place a finish embedded node on the successor (to create a finish-to-finish relationship). The two can now be linked together by selecting the embed and the opposing activity and clicking the [icon_cmd]Link[/icon_cmd] icon. How does the advanced text positioning work? These options do not correspond with the positioning of the text box on the canvas, only the behavior when the page size is changed or the canvas is stretched. By default, a text box is positioned relative to dates (like all other objects). This is useful for creating a note or annotation – the text box will move with the network when the page size is changed or the canvas is stretched. A text box may also be positioned relative to the canvas border. This is useful for creating a header, footer, or watermark – the text box will not move with the network when the page size is changed or the canvas is stretched. If a text box is positioned relative to the canvas border, a constant offset is maintained between the point designated on the text box and the point designated by the canvas border. To create a header, set the text box Reference Point and the canvas border Reference Point to TC (Top Center). To create a footer, set the text box Reference Point and the canvas border Reference Point to BC (Bottom Center). To create a watermark, set the text box Reference Point and the canvas border Reference Point to MC (Middle Center). Proceed by manually positioning the text box in the appropriate location. If logic mode is on, why do I still have negative-gap links? Once created, negative-gap links will not be corrected by the system until Logic Mode is turned back on and one or more of the activities impacting these links are moved (either the predecessor or successor of the link with negative-gap or an activity which falls on the same path as the link with negative-gap). Negative-gaps links are not automatically corrected. What are the rules for using embedded nodes? Embedded nodes are used to create start-to-start or finish-to-finish relationships. A start embed can only be placed on a predecessor activity and linked to a successor activity or finish embed. A finish embed can only be placed on a successor activity and linked to a predecessor activity or start to embed. What is the difference between a milestone and a benchmark? Milestones and benchmarks both represent events which have no duration in time. Milestones, however, are known as tracking – once linked, a start milestone will snap to the start of its earliest successor (unless an NLT constraint is applied earlier); a finish milestone will snap to the finish of its latest predecessor (unless an NET constraint is applied later). Benchmarks are not tracking – they remain fixed at their set date and are unaffected by logic. Furthermore, benchmarks are known as float throttles – rather than having float calculated to the project completion (or drift to the project start), a benchmark may be used to better allocate float to predetermined stages. When an activity goes critical, how can I display its original color? Criticality is determined as soon as a given factor (i.e. float, drift, or total float) is less than or equal to a given threshold (i.e. value). By default, the threshold is set at zero and the factor is set as float, meaning that as soon as an activity’s float equals zero, it will go critical. To override this setting, click Schedule > Modify Settings… and choose the Properties tab. Next to Criticality Threshold, change the value to something which allows activities to never go critical so as to over-ride their critical color (for example, -1000). Note: this will effectively ignore criticality across the entire schedule. Another option is to use delay objects instead of activities. You may choose to override the critical color for all delay objects by choosing Actions > Override Critical Color for Delays without affecting criticality for the rest of the schedule. Sometimes, it may be desirable to draw and link activities rapidly, without worrying about entering exact dates or fine-tuning them on the canvas. This may be achieved by clicking the GPM®/CPM icon in the toolbar. When in CPM Mode, all linked objects are forced to their early-start dates. This means that successors can be drawn as late as desired – once linked to their predecessors, any gap will automatically collapse to zero and pull the activity back. When returning to GPM Mode, all objects will return to their GPM planned-dates. Why can’t I paste activities into my new plan? You can copy activities from one plan and paste them into another, so long as they fit within the range of the calendar where they’re being pasted. The calendar start and end may be adjusted by clicking Schedule > Modify Settings… from the menu bar and choosing the Dates Tab. How are the early-dates and late-dates curves calculated? The baseline curve can be calculated as Rn = Rn-1 + i = 1j Rni where Rn is cummulative resource usage till nth period and j denotes total number of activities consuming resources on the nth period. The early-dates is equal to the baseline curve where the drift has been removed from all activities. The late-dates is equal to the baseline curve where the float has been removed from all activities. Multiple activities, and even multiple objects, may be modified simultaneously. First, select the desired objects on the canvas by drawing a box around them with the Select Tool or by selecting them individually with the Multi-Select Tool. Next, click Object Properties > Set Properties for Selected Objects… from the menu bar. Each tab of the corresponding window contains any properties which may be modified globally. Notable exclusions include unique properties, such as descriptions and IDs. Any change made will override the individual settings for all objects selected, but only for the given type. For example, if the box next to float is checked in the Activity tab, every activity selected will have its float displayed on the canvas, but not every milestone. The box next to float would have to be checked in the Milestone tab as well. The resource histogram shows the daily consumption of resources (or weekly, monthly, etc. as long as it’s greater than the schedule’s time unit) for each activity. 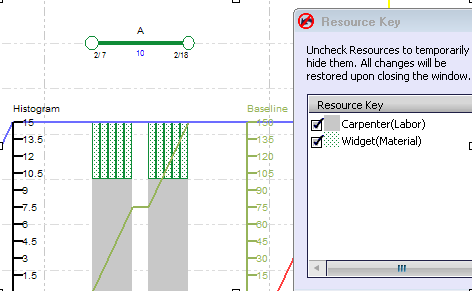 In this simple example, we know Activity A requires 15 units each day of a combination of resources – specifically, about 10 of those are carpenters and about 5 of those are widgets. We know this by measuring the height at which each resource coincides with the histogram plot ruler. This is what the histogram does – it makes it quick and easy to see graphically which resources have been assigned to which activities and how much are required each day. In this example, the activity’s duration has been changed from 10 days to 5 days. Note that it still requires 10 carpenters per day even after the duration has changed, which means that it must have been assigned 10 carpenters per day. The amount of widgets, however, has increased from 5 to 10, which means that Activity A must have been assigned 50 widgets per duration. The resource curves show the total cumulative consumption of resources for every activity. For Activity A, the total consumption is derived by multiplying the histogram (i.e. daily consumption) by the total duration of Activity A. From example 1 to example 2, you can see that the total consumption drops from 150 to 100 as the duration decreases. Add the total consumption for every activity together and the result is the baseline curve, colored green. The early-dates curve, colored blue, shows what the total consumption would look like if every activity were on its early dates. The late-dates curve, colored red, shows what the total consumption would look like if every activity were on its late dates. How do I delete the data date? A data date may never be deleted. However, the most current data date may be reset to the project start. This will have the effect of deleting all previous data dates and de-actualizing all objects. To reset a data date, right-click on the data date and select Reset to Project Start. Alternatively, the most current data date may be hidden. To hide the data date, click Schedule > Modify Settings… from the menu bar and choose the Displays tab. Uncheck or check the box next to Current Data Date to hide or show it respectively. How do I move the data date? The date of the data date can never be modified graphically by selecting and dragging; it may only be modified using the arrow keys or Gestural Interface. If a significant modification to the data date is required, consider placing a new data date on the canvas instead. When an activity is actualized, how can I display its original color? According to CPM, the float of an actualized activity is equal to zero. By default, this activity is now critical, and the bar color will change to red. According to GPM®, however, an activity retains its float once actualized. To restore its original color, calculate float according to GPM instead of CPM (Objects > Display Floats and Drifts as Forensic). Click Start > Control Panel. The Control Panel window will open. Click Adjust Screen Resolution under Appearance and Personalization. Choose a new setting next to Resolution. NetPoint requires a minimum screen resolution of 1024×768. If the minimum setting is not available for that projector, please change to a projector that supports the minimum required resolution. When importing from P6, why are my dates incorrect? NetPoint® will import and export to Primavera P6 versions 6.0, 6.1, 6.2, and 7.0. The user must have administrative privileges and the Primavera Integration API must be installed. Before importing a schedule from P6 to NetPoint, the project must be scheduled in P6 (by pressing the F9 key or selecting Tools > Schedule from the menu bar). Otherwise, the import process may terminate abnormally or imported dates may become corrupted. Why are the import/export and/or excel reporting options disabled? If you’re unsure whether or not these criteria have been met, please contact your IT department. If import/export are still disabled, make sure the P6 Integration API is in the right directory (c:\program files\primavera\integration api). To import/export with MS Project or Excel, macros security settings must be set to medium/low or disabled. If running Windows 7 or Vista, make sure the privilege level is set to “run as admin”. See Configuring NetPoint® for Import/Export from the user guide for more details. After crashing, NetPoint® is unable to recover my plan or load successfully. The reason for this is that the version of Outlook being used is 64-bit, which is incompatible with NetPoint. For a long term solution, Outlook must be completely uninstalled and then reinstalled using the 32-bit version. For the time being, however, the schedule must be attached manually from within Outlook and then sent. In 5.0 a copy of the zipped .nzp NetPoint project folder is available in each NetPoint project folder for easy attachment. Private: Why does NetPoint® keep crashing during startup? Why are some windows, text, and/or buttons jumbled and/or out of proportion? Click Appearance and Personalization and then Display. Choose Smaller – 100% (default). Log off and back on again. Why are the canvas, print setup, or paper size not showing up? Check that the screen resolution is within an acceptable limit. NetPoint requires a minimum screen resolution of 1024×768 and a 16-bit color setting. Why can’t I install the evaluation copy? If you are unable to download and/or install NetPoint®, temporarily disable any firewalls, anti-virus software, pop-up blockers, and download accelerators, and make sure your login credential has sufficient privileges to install software on your local computer. If you are still unable to download and/or install NetPoint, please contact your systems administrator to see if your computer is behind any system wide firewall or network appliance that could be preventing this type of download or installation from happening. Why do I get “Failed to Create Empty Document” Message?